Providing you the best range of flameproof vibration switch, weatherproof vibration switch, acd electronic vibration switches and electronic vibration switch with effective & timely delivery. 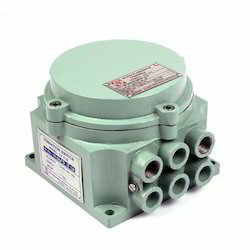 Flameproof Vibration Switch is designed as direct replacement of mechanical vibration switches. These mechanical switches being used in yester years have very little merit and served the purpose when the requirement was not stringent. As they rely on large impacts or inertia (both acceleration) nuisance tripping during start-up is an usual problem. Further, sensitivity adjustment is too ambiguous to offer any meaningful translation. ACD vibration switches can be directly installed in place of mechanical vibration switches and offer immense advantages. The basic sensor is piezo electric accelerometer which has no moving parts. 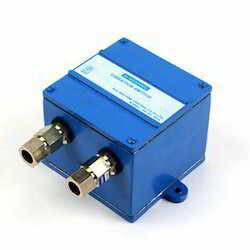 These electronically integrate the acceleration signal giving velocity signal. Vibration could be controlled very precisely with graduated controls. Built in electronic delay takes care of startup and other spurious signals. Remote reset is another positive advantage. Either `Stand Alone’ or `Remote Sensor’ options are available. 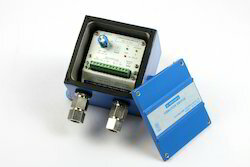 These switches can be supplied in enclosures suitable for weather proof (IP 65) application or for gas areas IIA – IIB (CLASS I, DVN.I GRP. C&D) OR IIC (CLASS I, DVN II, GRP.B) Some of the applications are Cooling Towers, Centrifuges, Large Motors and Generators, Compressors, VSI Crushers, Naval Vessels etc. 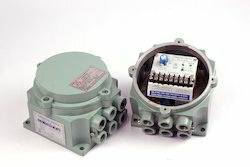 Electronic Vibration Switch is designed as direct replacement of mechanical vibration switches. Some of the applications are Cooling Towers, Centrifuges, Large Motors and Generators, Compressors, VSI Crushers, Naval Vessels etc. ACD Electronic Vibration Switches is designed as direct replacement of mechanical vibration switches.